The CFP Board (the non-profit organization that establishes the standards of competency and ethics for personal financial planners) has recently come out with updated ethics standards. 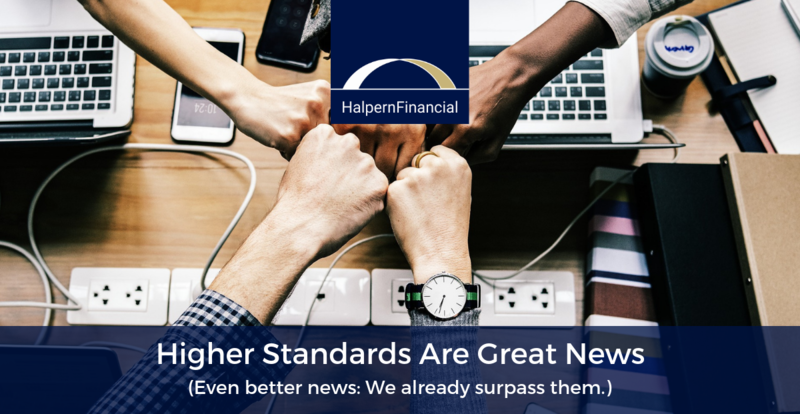 You’ll be pleased to know Halpern Financial already complies with this higher standard! In the past, depending on the type of firm a CFP professional worked for, they were only required to behave as a fiduciary for certain types of accounts. We have never done things that way because we believe in conflict-free advice, and holding ourselves to the highest standard, even if it isn’t “required”. Now, the CFP Board has closed this loophole, requiring that a CFP® professional must act as a fiduciary at all times. In addition, the CFP Board has made their ethics standards much more consumer-friendly. A key example of this is a specific standard for using terms that consumers often find confusing, like “fee-based” (commission and a fee) versus “fee-only” (only a fee for advice, no other compensation). We abide not only by the CFP Board code of ethics, but also NAPFA’s, one of the strictest in the industry. In everything we do, we follow the Golden Rule: we treat our clients as we would want to be treated. This means following a strict fiduciary standard. We have and will always place our clients’ best interest first, and we have a fee-only structure for our business, which places advisor and client on the same side of the table. As always, we are proud to serve our clients in a fiduciary manner. We will continue to meet and surpass the highest standards in ethics, practice management, technology and continuing education to provide the best advice to you.